So tonight’s the night. I’m pretty sure I’ll be in bed within the first quarter. We’re watching the build up on Sky Sports, Kevin Cadle and the British guy Neil Reynolds, and some other guy without an iPad. So far we’ve had the battle of the Brothers, because the coaches are John and Jim Harbough. Who do we want to win? Jimmy of course! Are we going to switch to BBC2? 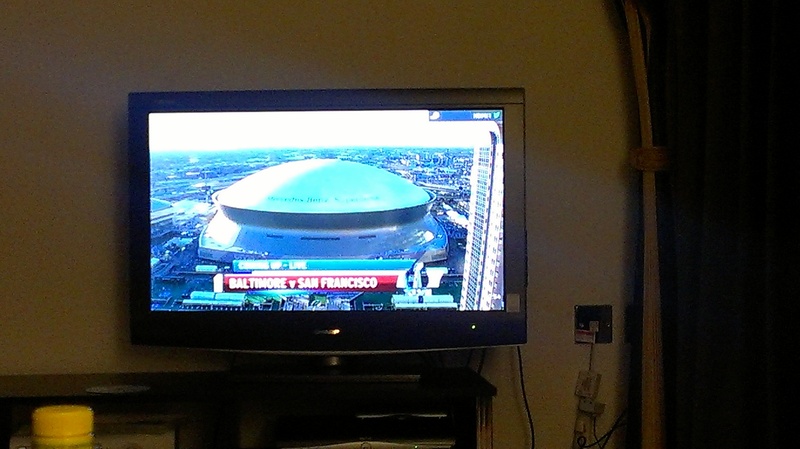 So, the stadium itself was rebuilt after Katrina and seriously it looks amazing, and everyone looks so excited! Just wish it was the Broncos of course. Ray Lewis is talking about the time he went to talk to the London Warriors, so inspiring – but they just mentioned the murder, haha! Yes Neil Reynolds I don’t like him. Who’s commentating on BBC2? Who the hell is Mark Chapman? He’s British, let’s switch back. Anyway, let’s get to this! This entry was posted in American Football and tagged bbc, sky, superbowl, timing, tv. Bookmark the permalink. ← And here we are in San Francisco!